Create a folder for a SharePoint list when creating a view is not sufficient to group and manage your content. Folder creation for lists is less common than for SharePoint libraries. Unlike for a library, a folder can not be created on a list until the default setting is changed. The SharePoint list owner or a user with design permissions can enable whether new folders can be created. To enable folder creation when you have at least owner or designer permissions, go to List settings > Advanced settings > Folders, select Yes >OK. By default, you use the New Folder command to create a folder in SharePoint Online lists. The create folder command however may not be enabled unless the list owner or administrator did so. Go to the SharePoint site containing the list where you want to add the folder. 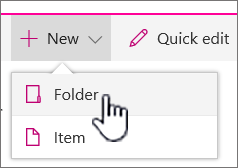 Click the name of the list on the Quick Launch bar, or click Settings , and click Site contents, and then click the title of the list you want to add folders to. Note: Does your screen look different than this and you're using SharePoint Online? Your administrator may have SharePoint Classic experience set on the document library. 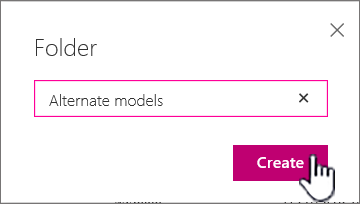 If so, see Creating a folder in a SharePoint Classic experience list. In the top toolbar, click the + New button, and then select Folder from the drop down. Note: If the + New folder command is not visible, you can turn it back on with at least owner or designer permissions. Click Settings , click List settings, and then click Advanced settings. In the Folders section, click Yes for Make "New Folder" command available. Note: To change the folder name later on, click the ellipses ... , and then click Edit. Change the folder name, and click Save. In the Folder dialog box, type a folder name in the box, and then click Create. For more info, see Edit and manage permissions for a SharePoint list or library for more info. You might consider using SharePoint views instead of folders, because they enable content to be filtered, grouped, and sorted in multiple ways. If you have a large list, a combination of views and folders might work best. To create views, see Create, change, or delete a view of a list or library. Note: If the New Folder command is not available, you can turn it back on if you have at least owner or designer permissions. On the Library tab of the ribbon, click Library Settings, and then click Advanced settings. In the Folder section, make sure that the Yes option is selected for Make "New Folder" command available. Navigate to the SharePoint site containing the list where you want to add the folder. In the Ribbon, click the Items tab, and then in the New group, click New Folder. Note: If the New Folder command is not available, you can turn it back on if you have at least owner or designer permissions. On the List tab of the ribbon, click List Settings, and then click Advanced settings. In the Folder section, make sure that the Yes option is selected for Make "New Folder" command available. In the Create a new folder dialog box, type a folder name in the Name box, and then click Create. A SharePoint list owner or a user with design permissions can determine whether the New Folder command is displayed by changing the advanced settings. In the New Folder dialog box, type a folder name in the Name box. In SharePoint Server 2016 you can optionally invite people to share the folder. Click Create or Save when you're done. To quickly go to the next level up in the folder hierarchy, in the Ribbon, click the List tab and then click Navigate Up. You might consider using SharePoint views instead of folders, because they enable content to be filtered, grouped, and sorted in multiple ways. If you have a large list, a combination of views and folders might work best. To learn how to create views, see Create, change, or delete a view of a list or library. By default, the New Folder command does not appear in lists. A SharePoint list owner or a user with design permissions for the list can determine whether the New Folder command is displayed by changing the advanced list settings. Navigate to the SharePoint site containing the list for which you want to add the folder. Click the name of the list on the Quick Launch bar, or click Site Actions, click View All Site Content, and then under the appropriate list section, click the name of the library. In the Ribbon, under the List Tools section, click the Items tab, and then in the New group, click New Folder. Note: If you have at least owner or designer permissions, you can turn on folders for a list. Click List in the ribbon > List Settings > Advanced settings. Under Make "New Folder" command available?, click Yes. To do this, you need to have at least owner or designer permissions. You might consider using SharePoint views instead of folders, because they enable content to be filtered, grouped, and sorted in multiple ways. If you have a large list, a combination of views and folders might work best. To learn how to create SharePoint views, see Create, change, or delete a view of a list or library. By default, the New Folder menu does not appear in SharePoint lists unless it is enabled by the list owner. This is enabled by changing the advanced list settings. If the SharePoint list is not already open, click its name on the Quick Launch bar. On the New menu , click New Folder. Follow the steps to name and click OK.
Was this article helpful? Is there missing content? If so, please let us know what was missing or confusing at the bottom of this page. Please include your version of SharePoint, OS, and browser. We'll use your feedback to double-check the facts, add info, and update this article.